The 39.62 metre motor yacht Amitie, listed for sale by Jason Lozeau at Galati Yacht Sales, has been sold in an in-house deal. Built in GRP by US yard Westport to a design by Gregory C Marshall, Amitie was delivered in 2008 as one of the yard’s 130’ models. Accommodation in an elegant mahogany interior is for up to 11 guests in five well appointed cabins. The master suite is on the main deck and has a large triple shower plus large windows giving great views. A stairway leads down to two VIP cabins with king sized beds and two twins, one with a Pullman berth, and all with full en suite shower facilities. The aft deck is the most spacious in its class, featuring a large round table for casual al fresco dining, an aft settee, occasional chairs and a functional service bar. A large party can be hosted on this aft deck and not feel crowded. Entrance to the main saloon is through double stainless steel and glass doors. There is a large L-shaped sofa to port with two occasional chairs and an ottoman. The saloon windows are very large, offering panoramic views while relaxing in front of the entertainment system or at the games table on the starboard side. The formal dining area is located in the forward part of the saloon and accommodates 10 guests. The upper aft deck features a large L-shaped settee and table to port, a built-in television screen and an overhead customized awning supported by carbon fibre poles. Going forward from the upper aft deck is the sky lounge with large windows, an office, day head, wet bar, fireplace, L-shaped sofa and several occasional chairs. 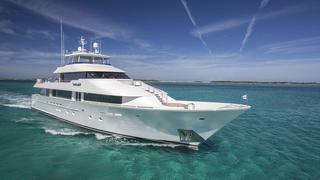 She is powered by two 2,735hp MTU engines and is fitted with Naiad at anchor stabilizers.